Buffered VPN is known for having fast, reliable VPN connections on a host of servers around the world. Featuring unlimited bandwidth, no download restrictions, and a clean, simple to use interface, Buffered offers a lot in terms of VPN features. While one of the more expensive options out there, it’s nonetheless a top contender for best VPN. If you do go with Buffered, you’re going to get solid protection and performance in an easy to use package. However, if you’re looking for a long lineup of advanced features, you may want to check out some of our other reviews for high-end VPN service providers at often lower prices. 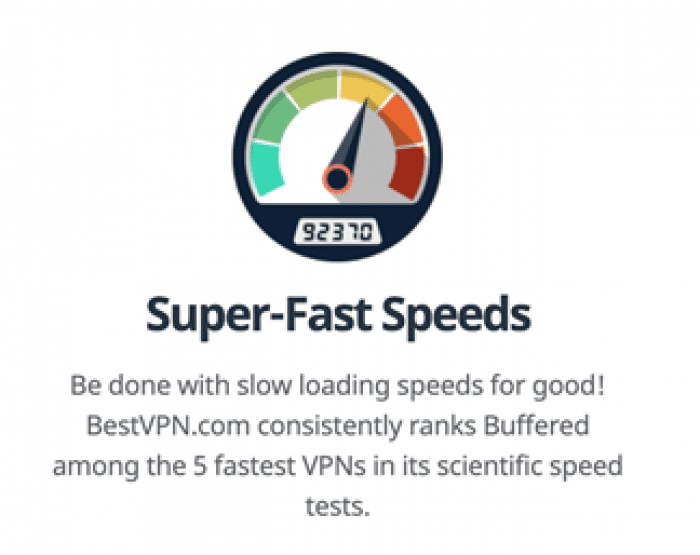 Buffered makes it easy to get started and browse the internet safely, and is consistently rated as one of the most secure VPN services available today. Regardless of which provider you choose, browsing the internet through a VPN connection is a smart, simple way to keep your information safe online. If you’re not using a VPN, your information may be at risk. While pricier than average in the world of high-quality VPNs, Buffered is a solid choice if you’re looking for something simple, straightforward, and safe. In our Buffered VPN review, we’ll show you everything there is to know about the service and why it may be the right choice for your VPN needs. As we mentioned, Buffered isn’t going to be the cheapest VPN service on the market. Buffered offers three price tiers depending on your needs and how long you need the service. The great news is that all price plans come with the same features, so you don’t have to worry about missing out on features if you don’t want to commit to a long-term plan. There is a month to month option that is currently priced at $12.99 per month. While having a month to month option is great, it’s one of the more expensive options on the market. If you want to test out Buffered before committing, this is a great option to try it out without getting locked into anything. If you know you’ll need the VPN service for a long time, Buffered offers significant discounts on their one-year and two-year plans, which is where the real value comes in. For the one-year plan, Buffered charges just $6.59 per month, which is a 50% savings over the month to month plan. Picking the two-year plan saves you even more money. At just $4.12 per month, the two-year plan is by far the best value for a Buffered VPN plan, and is just $20 more in total than the one-year plan. If you’re not completely satisfied with the service, you’re protected under a 30-day money back guarantee. While we’d prefer to see a free trial period rather than a money back option, it’s better than nothing at all. To keep your identity anonymous, Buffered allows you to pay with Bitcoin. You do have the option to pay with a credit card or with PayPal, but paying with Bitcoin makes your identity secure when signing up for the service, which is ideal for anyone looking for maximum privacy and security. Let’s take a look at some of the features to see what all you get with a Buffered VPN subscription and why it’s consistently rated as a top VPN service. There are a lot of reasons to choose Buffered as your VPN service, and even though the interface is simple and it may not offer a lot of advanced features, it’s a solid service that will keep you safe and secure online. From industry-leading security protocols to availability on a wide range of devices, here are some of the top features that Buffered VPN has to offer. What really sets Buffered VPN apart from other top competitors is that you can connect your router to Buffered VPN services. That means you don’t need to set up your individual devices to the service and you can connect virtually unlimited devices to the VPN through your router. The VPN router service makes it easier than ever to connect and safely browse the internet. You don’t need to manually connect every time you start a session. With easy setup and installation and the option to purchase a pre-configured router, Buffered’s router VPN option is a great way to protect all of your connected devices. Speed is another category that Buffered excels. Most VPN services reduce speeds when you connect to the network, which makes sense because your traffic is either being bounced around multiple servers or potentially passing through a server in another country. You’ll experience some speed reduction when you connect to Buffered, but it’s rarely over a 10% speed reduction. Considering some services can slow your speeds by 50% or more, that’s a huge win. In fact, there are some servers on Buffered’s network that may actually increase your internet speed. That speed can vary based on a wide range of factors, such as your current ISP and connection speed, location, and even the hardware you’re using, but experiencing a potential speed increase while connected to a VPN is a major bonus. As it currently stands, Buffered users can enjoy Netflix while connected to the network, and can even unlock geo-blocked content. With hundreds of servers in over 37 countries, that’s a lot of content. However, popular streaming services like Netflix and Hulu are constantly updating their VPN-detection programs, so we aren’t able to say how long you’ll have access to Netflix as a Buffered subscriber. The same can be said for any other VPN service that currently allows you to access both local and international Netflix content. Avid torrenters will be glad to hear that Buffered allows you to torrent on all of its servers. Where some other top VPN providers only allow you to torrent on specific servers, Buffered allows it every one of their hundreds of servers around the world. With open torrenting on all servers, users aren’t limited in their server choice. There isn’t dedicated torrenting support, such as dedicated high-speed networks or ad-blocking software, but it’s nice to see users have a lot of choices when it comes to torrenting. 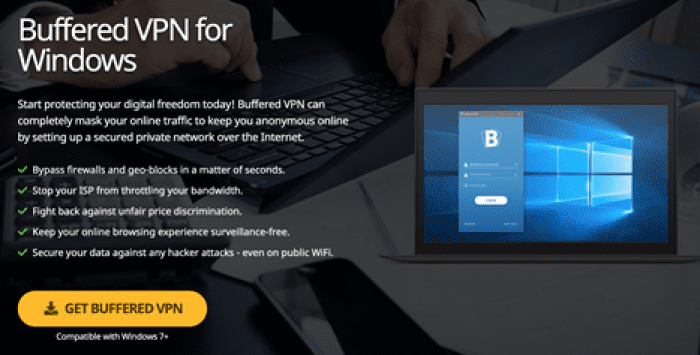 Buffered VPN is compatible with the latest versions of Windows, allowing users to use the simple, dedicated desktop app to connect to any Buffered server in the world. Launch the desktop app and get connected to a secure server in seconds. Your internet traffic data will stay safe and secure, and you can switch to any server at any time. Buffered doesn’t limit you on what server you can connect to and makes it incredibly easy to change your settings on the fly. Once you sign up for Buffered VPN, you can download the dedicated Windows desktop app and get started in minutes. Take your Mac security to the next level with the dedicated Mac Buffered desktop app. Just like the Windows app, you’ll experience a simple, straightforward user interface experience. Switch servers, favorite servers, and even view live server diagnostics including speed, connection time, and more, right from the desktop app. In addition to compatibility with Windows and Mac devices, you can use your iOS and Android devices with Buffered’s VPN services. Don’t forget, Buffered even has VPN options for your Wi-Fi router, allowing you to connect unlimited devices. If you don’t have a compatible router, you can purchase one from FlashRouters, a partner of Buffered VPN. Currently, Buffered has over 500 servers in almost 40 different countries around the world. With no limits to how many times you can switch servers, having access to so many servers has never been better. Some top competitors offer thousands of servers across the world, but in all reality, there are very few users who actually need that many servers. However, the more server options there are, the less likely it will be that a server is overloaded with traffic. It also allows you to connect to a nearby server virtually anywhere in the world, which means you’ll have stronger, faster connections to your VPN server. Check out the long list of server locations right from the website. The simple interface on the desktop or mobile app allows you to easily browse and connect to a server anywhere in the world. Buffered VPN uses the OpenVPN security protocol, meaning your information is extremely safe and secure, and the security protocol is updated regularly. Buffered VPN is also GDPR compliant and ensures your online safety no matter where you connect. The service also employs a very strict no-logging policy, meaning your information is never stored and saved. Using military-grade encryption and an automatic kill switch as soon as your connection drops, your internet data is safe from unwanted onlookers. All of your data is encrypted with 256-bit encryption, which is the highest encryption level available. You don’t want your internet traffic and sensitive data to be at risk, and when you choose Buffered, it doesn’t have to be. An updated customer support option is another top feature that Buffered users can take advantage of. In fact, even if you’re not a customer, you can use Buffered’s new chat feature to ask questions, review options, and even purchase your service. You’ll get dedicated support for all of your questions and concerns, and if you’re having issues with your VPN service, expert support is just a click away. In addition to a skilled support team, Buffered has a robust knowledge base that you can access any time of the day. Buffered breaks it down into multiple categories, making it easy to find just what you need. Access FAQs, troubleshooting guides, setup tutorials, a glossary, and even a dedicate resource that helps users understand common online scams and how to avoid them. Be sure to check out Buffered’s top security tips as well for even more ways to stay safe online, including Incognito searches, disabling location tracking on your devices, and tips for creating a safe password. Buffered has a lot to offer, and while it may be lacking in some areas when compared to other top VPN providers, it’s a good choice for new and experienced VPN users alike. Buffered features industry-leading speeds and security protocols, as well as a host of servers, an easy to use interface, and a dedicated support team to help you with all of your questions and concerns. The pricing could be more competitive, but if you’re signing up for the one-year or two-year plan, you’ll get some serious savings. The multiple subscription plans make it easy to find the right service for your needs. Paired with a 30-day money back guarantee, signing up for Buffered is easy and risk-free. We know that price is important, but so is simplicity, speed, and reliability when it comes to your VPN service. For something even more exceptional, be sure to check out the router VPN option. Compatible with almost any router available, the router VPN option makes it simple to protect all of your connected devices in your home or business. Offering everything you need to keep your devices and information safe, Buffered is always a great option. Whether you’re looking to try out a new VPN for a short period of time or need something for multiple years, be sure to check out Buffered. Have you used Buffered? Let us know about your experience in the comments below.